The Indiana Department of Environmental Management (IDEM) is responsible for administering the state stormwater management program. State stormwater requirements are mirrored after those in the federal NPDES program, requiring that stormwater be treated to the maximum extent practicable. 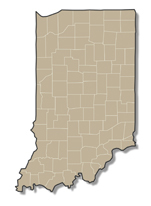 Indiana`s NPDES program requires all construction sites disturbing more than one acre, many industrial sites, and all designated Municipal Separate Storm Sewer Systems (MS4s) to obtain NPDES permit coverage. Most sites will be able to obtain coverage under the state general permit. Sites with considerable risk of contaminated water may be required to obtain an individual permit. No numeric stormwater treatment requirements have been established at the state level, but stringent regional and municipal regulations are in place in some parts of the state. Marion County, for example, requires the removal of 80% of the annual total suspended solids (TSS) load. To ensure compliance with all applicable stormwater regulations, it is recommended that you contact the municipality where the project is located.